Wedding fever is in the air! Couples are bucking tradition in favor of packing their bags for a destination wedding vacation with close friends and family. 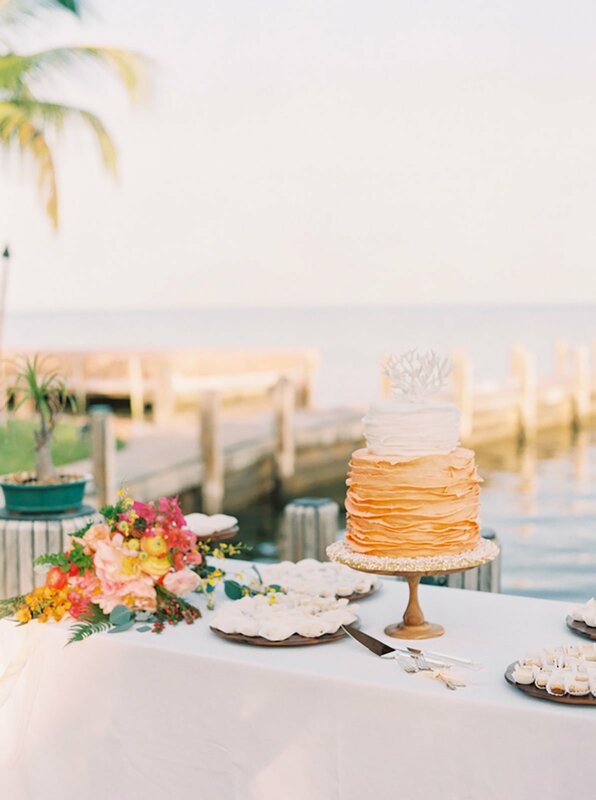 Destination weddings continue to grow in popularity and Eggwhites Catering has had the pleasure of catering a number of these tropical celebrations throughout South Florida and the Keys. Couples may choose to have a destination wedding because the location is personally significant or simply for the romance of travel. A destination wedding is a magical intimate affair that allows the bride and groom to extend the celebration and spend meaningful time to make memories with each and every guest. 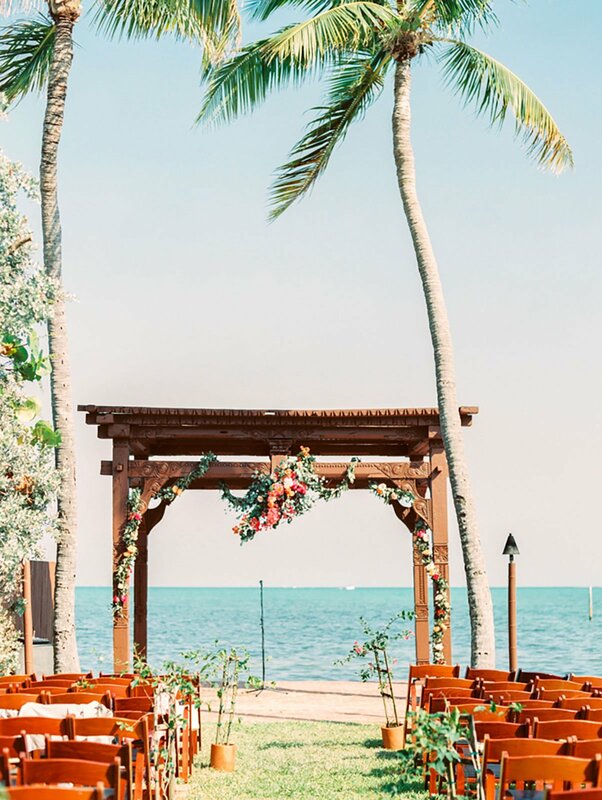 Islamorada is a favorite locale for destination weddings. The panoramic ocean views, white sand beaches and famously gorgeous sunsets of the Florida Keys provide a backdrop that dreams are made of. 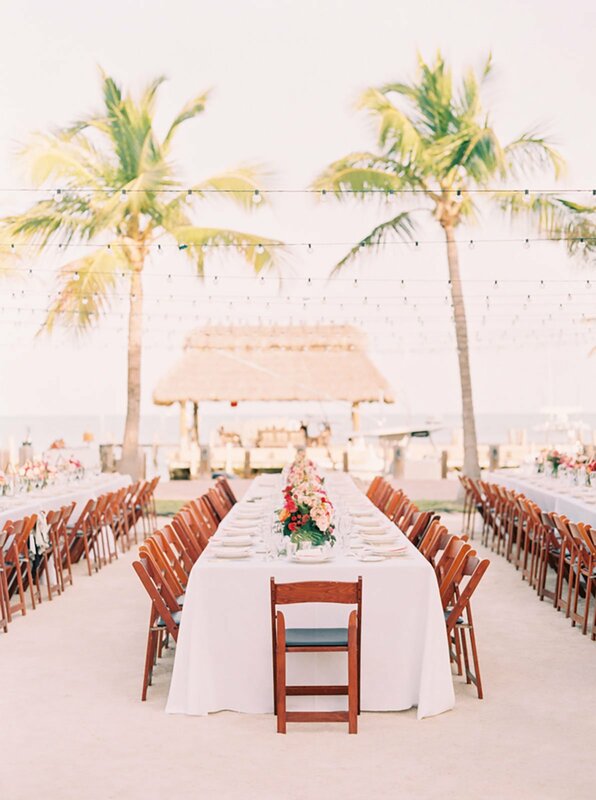 Only a short 1.5 hour drive from Miami, intimate, gorgeous homes and lush, tropical landscaping makes this the perfect destination wedding weekend. 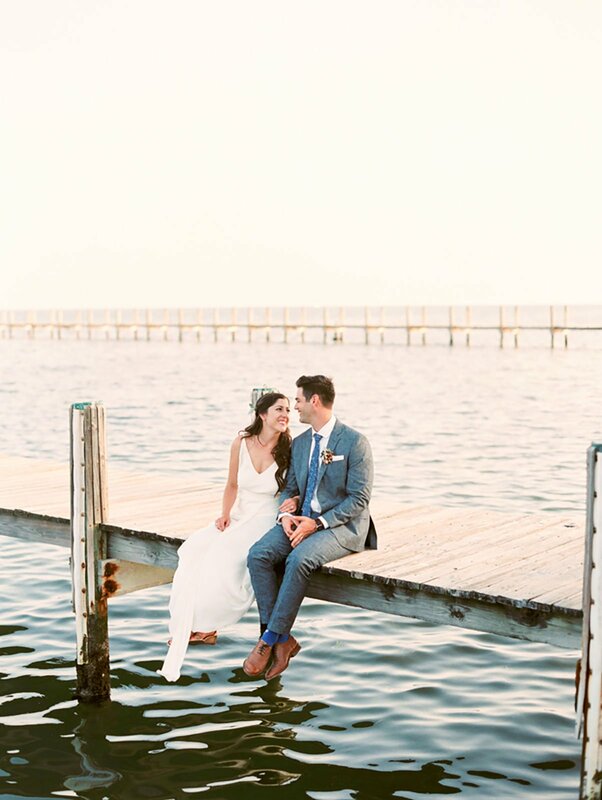 Francesca and Michael channeled Florida's carefree tropical vibes into every detail of their wedding celebration and the results were nothing short of magical. 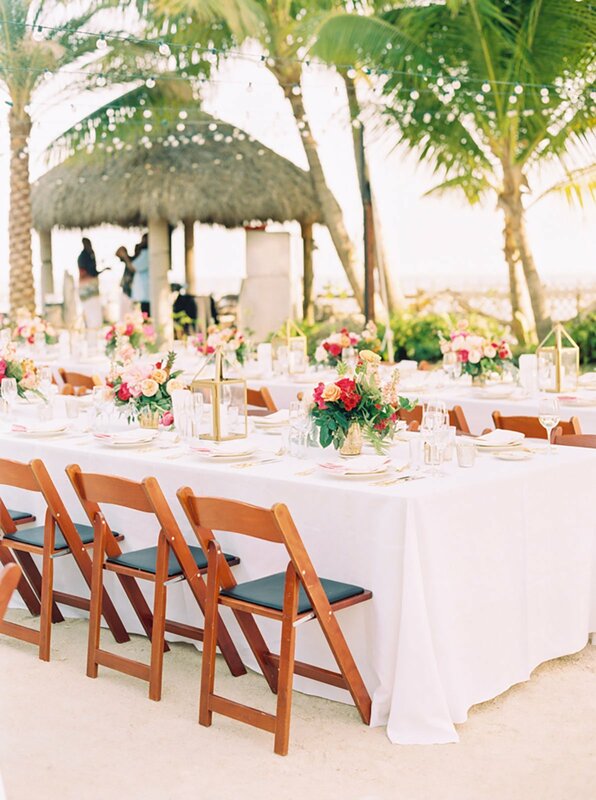 The wedding's soft color palette of blush pink, gold and neutrals meshed beautifully with the soft hues of the beautiful palm trees and sandy shores at this private retreat. Eggwhites Catering worked with wedding planner Danielle South and Ever After Floral Design to ensure the wedding was filled with pops of vibrant color on top of these soft hues. The couple were inspired by the natural beauty of the venue and they kept their décor natural and unstructured. Terra-cotta pots of bougainvillea, succulents and greenery served as aisle decor. Bougainvillea, eucalyptus, orange lisianthus, pink hydrangeas and peach roses were wrapped around the venue's ornate arbor. 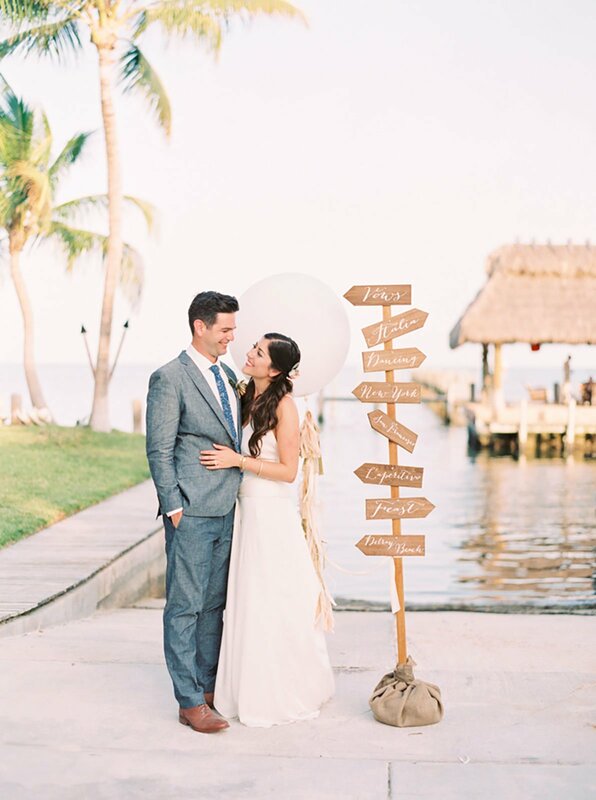 The twin palm trees that bookend the ceremony complete this awe-inspiring backdrop. A pineapple motif was carried throughout all of the impeccable details. 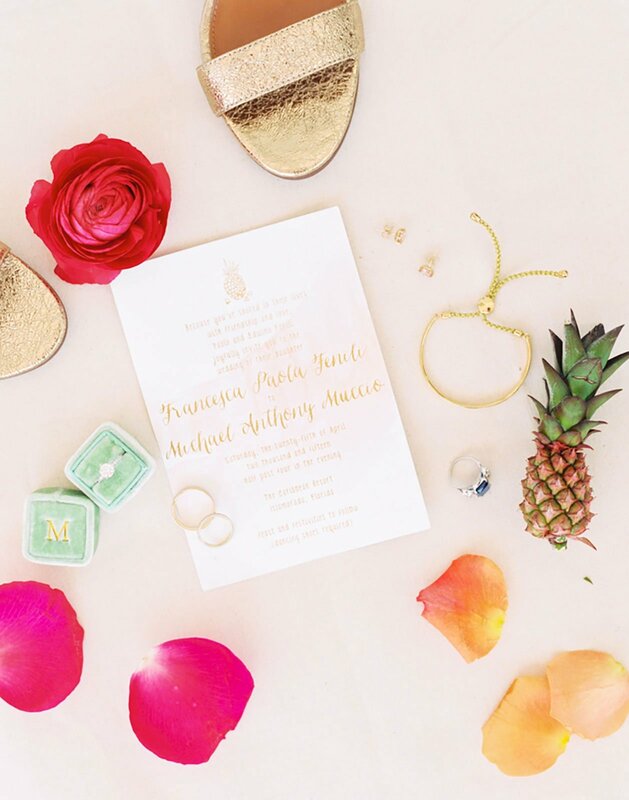 Not only is pineapple the bride's favorite fruit, but it has come to symbolize hospitality and affluence, expressing the sense of welcome, good cheer, friendship and family affection. When a whole pineapple is displayed at a social event, guests know that no expense was spared to guarantee the guests' enjoyment. 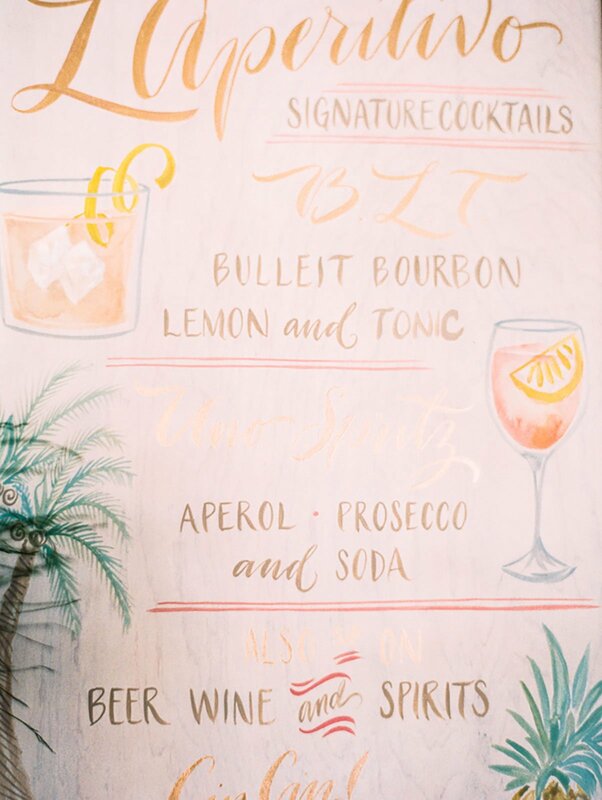 Following the ceremony, guests sipped on signature cocktails including an Italian Aperol Spritzer which was a nod to the couple's Italian heritage. Before sitting down to a cozy family-style dinner on the beach, guests enjoyed Conch Fritters, Blue Crab Cakes, Spicy Shrimp, Papaya-Mango Glazed Grilled Chicken Skewers and Baby Lamb Chops with Minted Ginger Marmalade. Family-style tables were set with white linens, ombre pink dinner napkins and gold dinnerware. 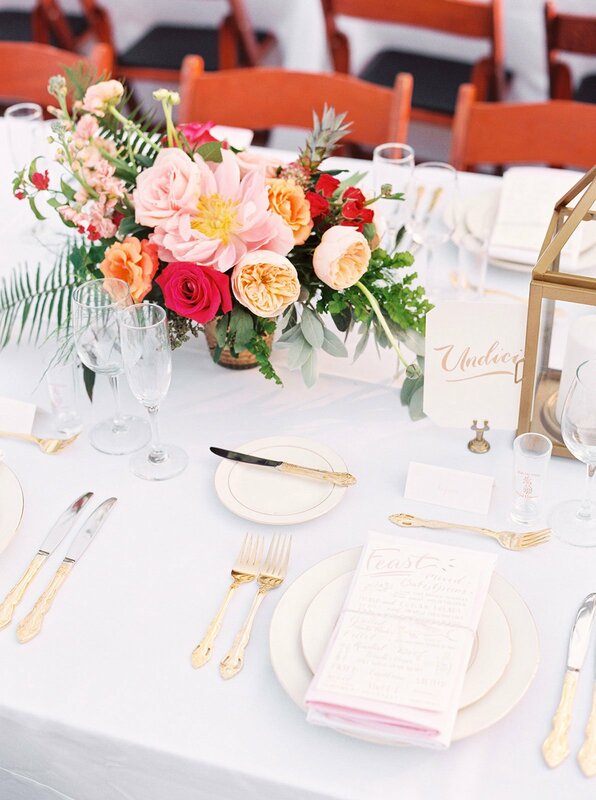 The blush and gold menu cards were beautifully illustrated and matched the silverware, place settings and napkins which were hand-dyed by the wedding planner! Bright centerpieces gave the table settings a vibrant pop of tropical color. Our island-themed menu included Grilled Mahi Mahi with Key Lime Chive Beurre Blanc and Roasted Beef Tenderloin with a Port Wine Demi-Glace accompanied by large steaming platters of Caribbean Skillet Sweet Potatoes, Platanos Murados (Sweet Fried Plantains) and Seasonal Vegetables. From the pink dinner napkins to the sunset-inspired orange gradient of the soft ruffled wedding cake, ombre tones were incorporated throughout the celebration. For more photographs from Francesca and Michael's Islamorada destination wedding, please view their wedding photo gallery. For more inspiration from real weddings catered by Eggwhites Catering, check out our Real Weddings Photo Gallery. And check back often as we are adding new galleries often! Whether your South Florida "home is where the heart is" or your bags are packed and you're ready to go, Eggwhites Catering will bring your vision to life! Our team of experienced wedding professionals is ready to guide you through every stage of the planning process to craft your perfect day for a personalized and inspired celebration.